Karma Kyle, the lovable little boy crocodile, is always getting into trouble. Thank goodness he has his meditating crocodile family to keep him in line. 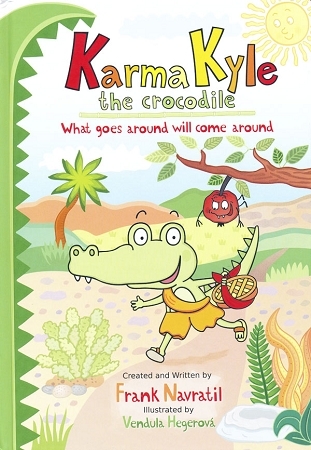 In the first of the Karma Kyle the Crocodile series, his parents give him a job to do and he sets out on his adventure with all the right intentions. Along the way he is confronted with Bad Apple, a very convincing but troublesome apple that steers him in the wrong direction. As Karma Kyle deals with greed, disappointment and loss, he learns that lying and stealing always lead to a bad ending. With support from Wise Owl and after a series of spectacular events, he finally learns that performing good deeds does bring rewards, and comes out smiling and winning in the end. In a clever blend of rhyme and rhythm, author Frank Navratil presents Karma KyleÂ´s adventure in an easily readable manner.